4:30 - 5:30 a.m. 3:30 - 4:30 p.m.
9:00 - 10:00 a.m. 6:30 - 7:30 p.m.
"Meditation implies turning your attention from what is finite and transient and directing it to the Divine, the eternal and absolute Existence/Consciousness." 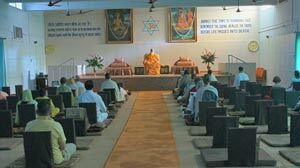 The main activity of Sadhana Kendra Ashram is meditation and prayer. Every day throughout the entire year, four meditation sessions are held in the common meditation hall, two of which are led by Swamiji himself. This programme of four daily meditations has been going on continuously for more than twenty years. Each one-hour session begins with the recital of a universal prayer, repeated in both Hindi and English. As Swamiji says, starting meditation with prayer helps to make the mind peaceful and receptive. The remainder of the hour is spent in silent meditation. Each seeker is free to meditate using the method of his or her choice, according to his or her preference and spiritual/religious tradition. A brief synopsis of Swamiji's teachings on meditation is available on our Art of Meditation page. All the meditation sessions are held in the large soundproof meditation hall, which is regarded as the very heart of the ashram. It is a place of quietude available to ashramites at all times for the practice of prayer and meditation. In order to maintain its sanctity and conducive atmosphere, talking, reading, writing, practice of yoga asanas, and other such activities are not permitted inside the hall. Most seekers prefer to sit cross-legged on the cushioned asanas, however chairs are also provided at the back of the hall for those who are unable to sit on the floor. "Prayer and meditation are food for the soul as bread, fruits and vegetables are food for the physical body. The soul becomes weak if one does not sit regularly in prayer and meditation."